The announcement was made by the Global Polio Eradication Initiative (GPEI) on Monday. 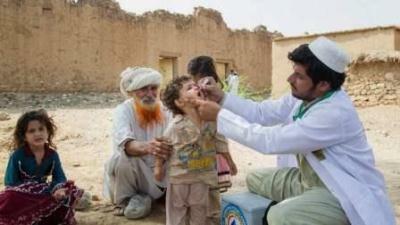 With commitments in 2011 and 2014, the UAE has contributed a total of $167.8 million since 2011 to help end polio, with direct support to Pakistan, Afghanistan, Somalia, Ethiopia, Kenya and Sudan. "We thank the UAE for their long-term generous support and unwavering dedication to polio eradication, and particularly the personal commitment of Sheikh Mohamed bin Zayed," said Dr Tedros Adhanom Ghebreyesus, director-general of WHO. "This is the kind of support that will ensure we reach every last child to complete the job and to show the way to delivering health to all." Speaking about the UAE's work, Mohamed Mazrouei, undersecretary of the Crown Prince Court of Abu Dhabi, said: "The UAE's pivotal role in eradicating polio completely is not limited to being a donor only, but extends to include its capacity to convene key groups and provide on-ground support to deliver vaccines in the highest risk areas of Pakistan. Following the Global Vaccine Summit, the UAE had expanded its role through the UAE Pakistan Assistance Programme (UAE-PAP) to ensure that further gains would be made where it was needed the most. Through the 'Emirates Polio Campaign' initiative, the UAE helped drive on-the-ground eradication efforts within the most vulnerable communities in Pakistan. In addition to the $120 million that Sheikh Mohamed bin Zayed pledged in 2013, he pledged a further $30 million to polio eradication, announced by Bill Gates at the Rotary International Convention in Atlanta, USA in June 2017. Akhil Iyer, UNICEF director of Polio Eradication, said: "The UAE's support - both as a leading donor and passionate advocate - has been critical for getting as close as we've ever been to making history by eradicating polio. This is a gift not only to the children of Pakistan but to all future generations of children, everywhere, who are so close to the goal of being able to be born and be raised in a polio-free world." Dr Chris Elias, president of the Global Development Programme, Bill and Melinda Gates Foundation, said: "Sheikh Mohamed bin Zayed and the UAE have shown an unwavering commitment to end polio, and we are delighted to partner with them in this effort. Without their involvement, achieving a record low number of polio cases in 2017 would not have been possible." Polio is a highly infectious disease that can cause lifelong paralysis, but it is entirely preventable with vaccines. Only three countries remain which have never stopped polio: Afghanistan, Pakistan and Nigeria. When the polio eradication effort was launched in 1988, 350,000 children were paralysed by polio every year across 125 countries. Polio eradication efforts have since made remarkable progress and there were only 22 cases in 2017 - the lowest ever recorded number. However, a number of key challenges remain. Reaching the most vulnerable children with the polio vaccine is hampered by a range of hurdles including difficult terrain, insecurity, and large-scale population movements.